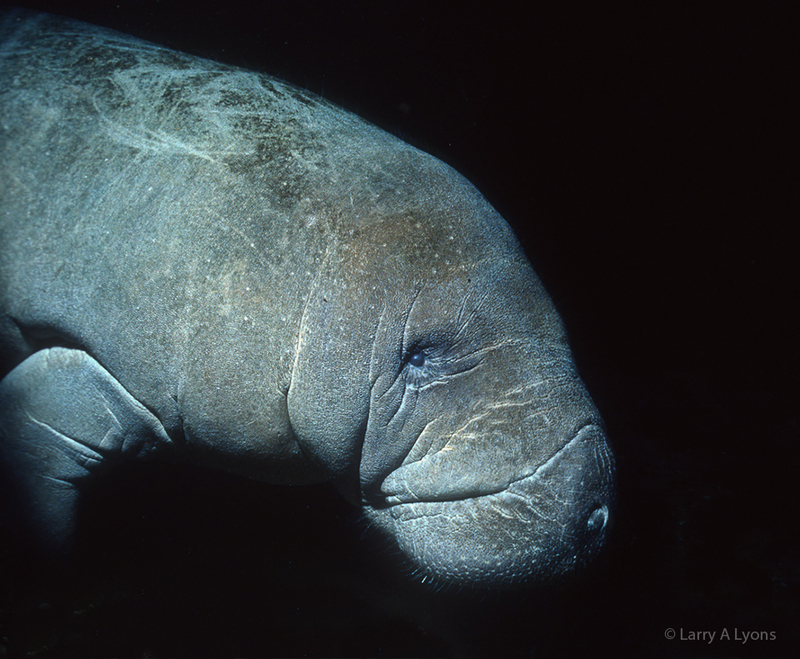 The manatee is an endangered species living in coastal estuaries and freshwaters in Florida. It is currently estimated that the “minimum” current population stands at about 5,000 manatees within the state of Florida. 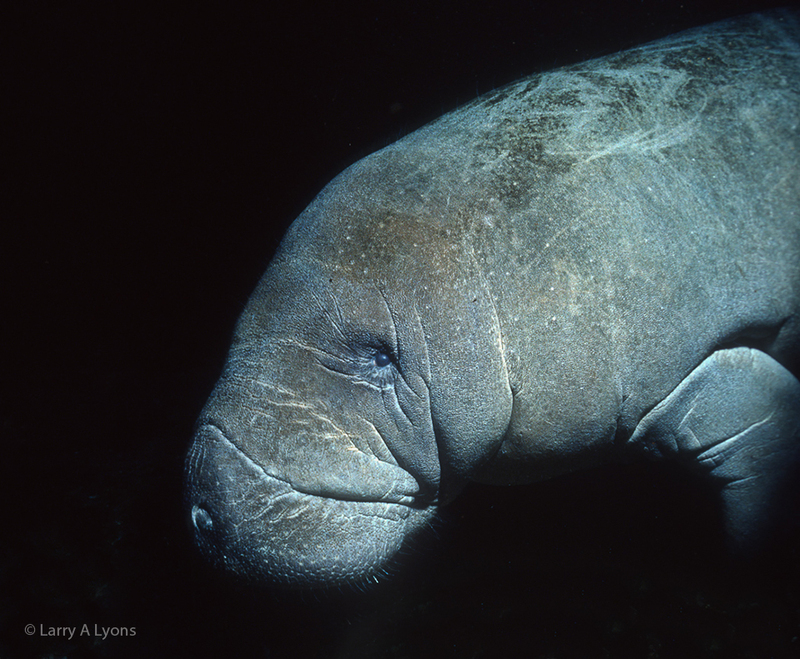 The endangered manatee is a large mammal also known as a sea cow. Manatees are believed to evolve from plant-eating and wading-like mammals with their closest relative being the elephant. In spite of their cuddly-like appearance and non-aggressive manner, manatees are as wild as free-ranging elephants. Manatees are migratory animals and in the summer will migrate along the eastern and western coasts of Florida. Some individuals will migrate as far north as the Carolinas and as far west as Texas. However, during the winter calendar months manatees do tend to concentrate near warm water springs or near thermal discharges of power plants within Florida. When water temperatures go below 68 degrees Fahrenheit (20 degrees Centigrade), the stress from the colder waters can be fatal. In the winter of 2010, more than 280 manatees died from an extended period of cold weather. One of the longest-term threats to the manatees is the loss of habitat of warm water habitats. Residential development in Florida continues to encroach on these warm water spring habitats that are essential for their survival. 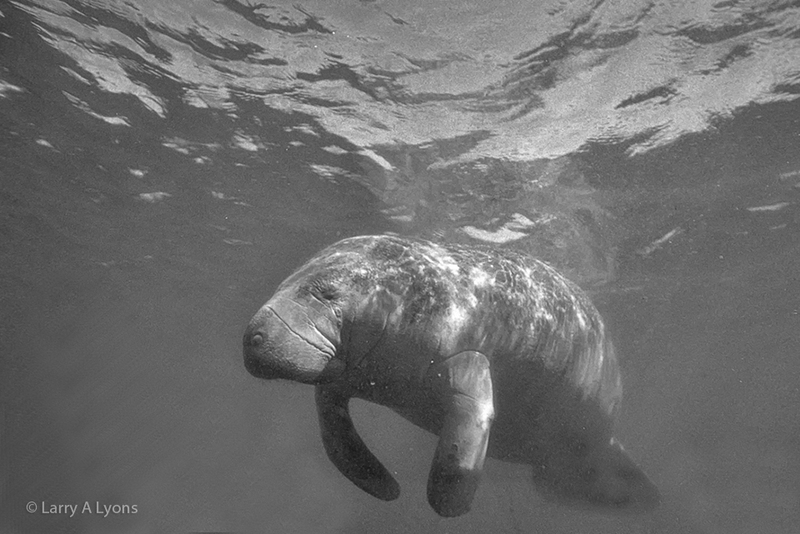 Although power plant discharges do provide the essential warm water for a large portion of the manatee populations, the expectations of these power plants not shutting down because of equipment failure or even being decommissioned creates a high risk to the manatee populations. A means of conserving “natural” warm water habitats within Florida is absolutely critical. The Crystal River National Wildlife Refuge including the Kings Bay in Florida, which is also referred to as the manatee capital of the world, was established for the protection of the endangered manatees in 1983. 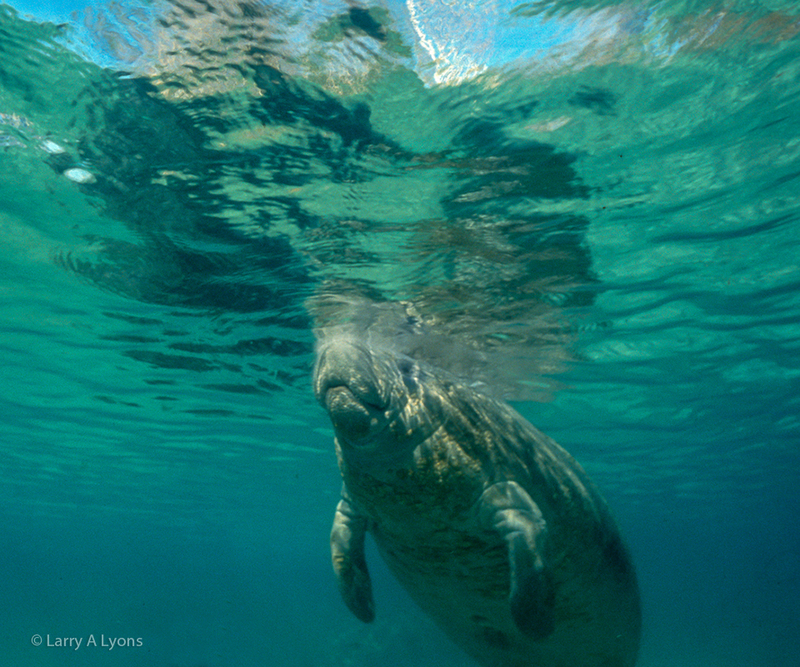 The warm water springs originating from Crystal River provide a critical sanctuary for the manatee populations that migrate there each year from November to April. During the winter months it is estimated that up to 600 manatees migrate into this sanctuary. All of these images were captured at the Crystal River sanctuary using a Nikonas V underwater film camera in January 1995. The Crystal River sanctuary has become a tourist attraction where it is estimated that 150,000 visitors come each year. Visitors are permitted to snorkel with the endangered manatees within designated areas following specific guidelines. Unfortunately there have been disturbing instances in which people have been harassing the manatees and swimming in areas that are strictly for manatees only. Of particular importance is that all watercraft travelling through manatee sanctuaries do so cautiously and at idle speed. It really is a remarkable and unforgettable experience to be able to swim with these gentle giants. If you have the opportunity, be sure to abide to the specific guidelines defined by U.S. Fish and Wildlife Service. Manatees are graceful swimmers powered by a strong tail. They generally swim along at three to five miles (5 to 8 kilometers) an hour, but they can swim up to 15 miles (24 kilometers) an hour on short bursts. Manatees are generally observed swimming close to the surface that creates a high level of risk of being injured or killed from outboard motors. Manatee mortalities are recorded each year by the Florida Fish and Wildlife Conservation Commission. These mortality counts define whether mortalities are the result of watercraft accidents, cold stress, natural causes, perinatal causes, undetermined causes, and other causes. From 2007 through 2013 it is estimated on the average that at least 20 percent of the manatee mortalities resulted from being struck by watercraft. It is also important to note that this 20 percent mortality from watercraft does not include all of the mortalities that were undetermined or the mortalities that go unreported. The manatee with their small eyes and no outer ears do have good sight and hearing. Manatees emit a variety of sounds used in communication. They can also communicate by smell, taste and touch. Their face contains over 600 vibrissae (whisker-like hairs), but the sensory function of the whiskers is unknown. Manatees must resurface regularly to breathe air through their nostrils. 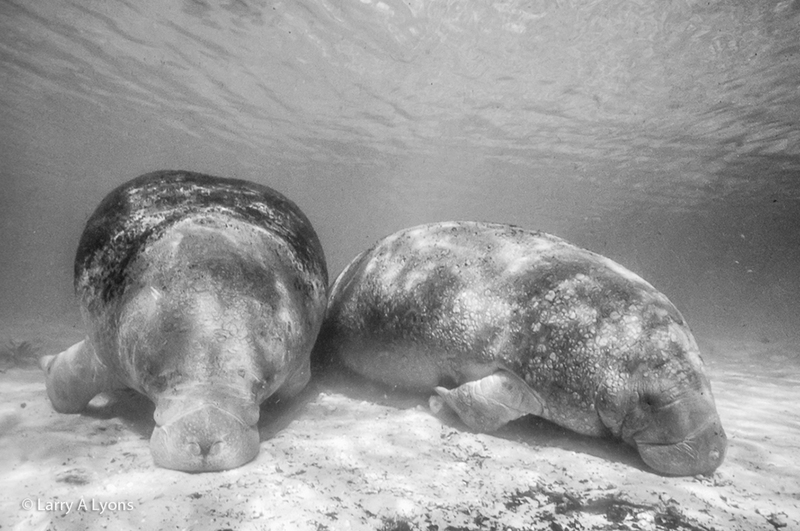 When just resting, manatees may resurface every 20 minutes. However, when they are moving about and consuming energy, they may resurface for a breath every three to five minutes. Resurfacing to breathe or just resting in shallow waters creates a high level of vulnerability for their survival from being accidently hit by boats. In fact, researchers can often identify many surviving manatees by the scars that have resulted from being injured from outboard motors. 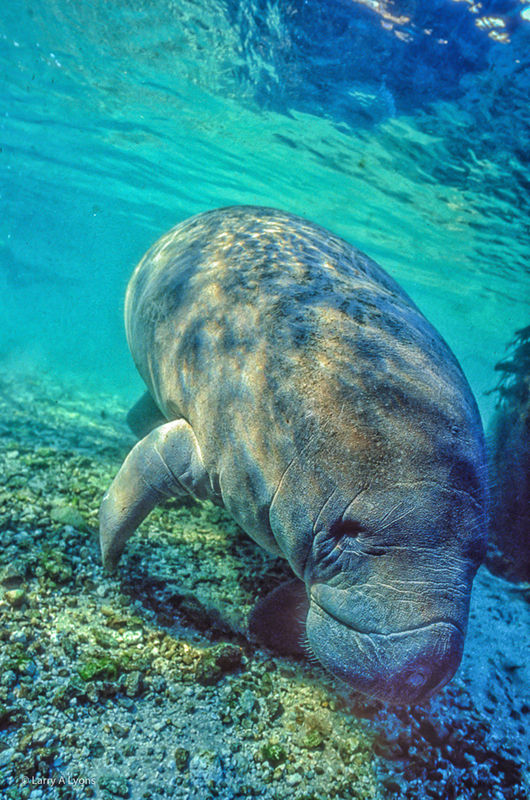 Manatees are herbivores grazing on algae, sea grass and a variety of other aquatic plants. They consume 10 to 15% of their body weight in vegetation each day. 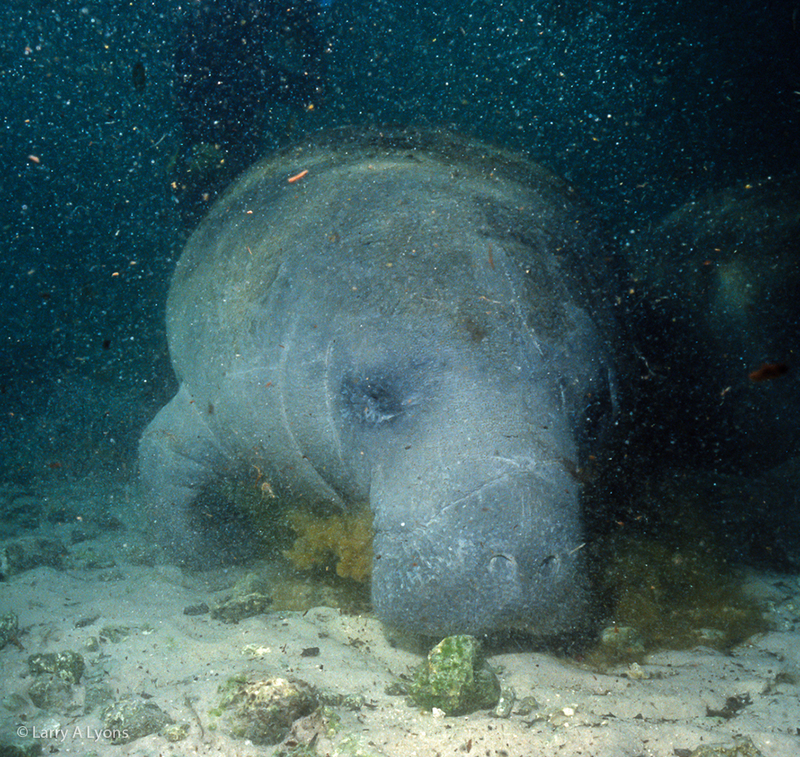 By far, sea grass beds would be the most important source of vegetation for the manatees. 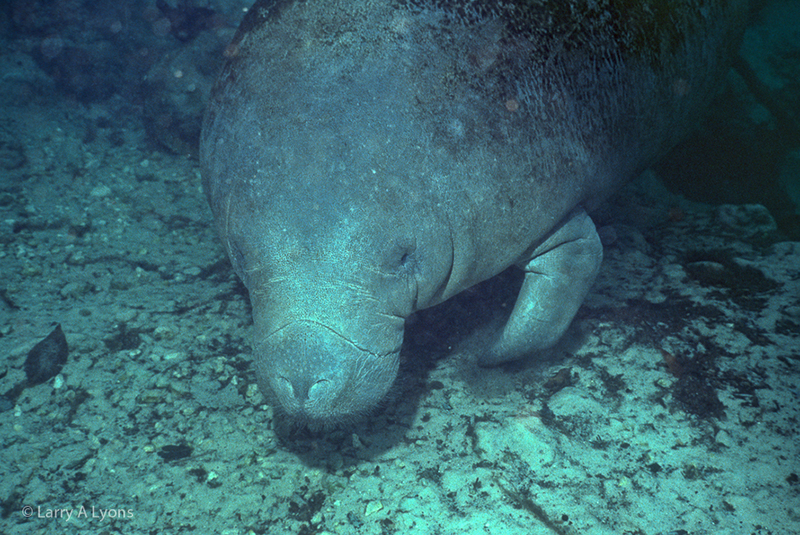 The manatee above is grazing on algae and stirring–up sediment in the process. Manatees are gentle giants with an average length of ten feet (3 meters) and weighing up to 1,200 lbs. (540 kg). 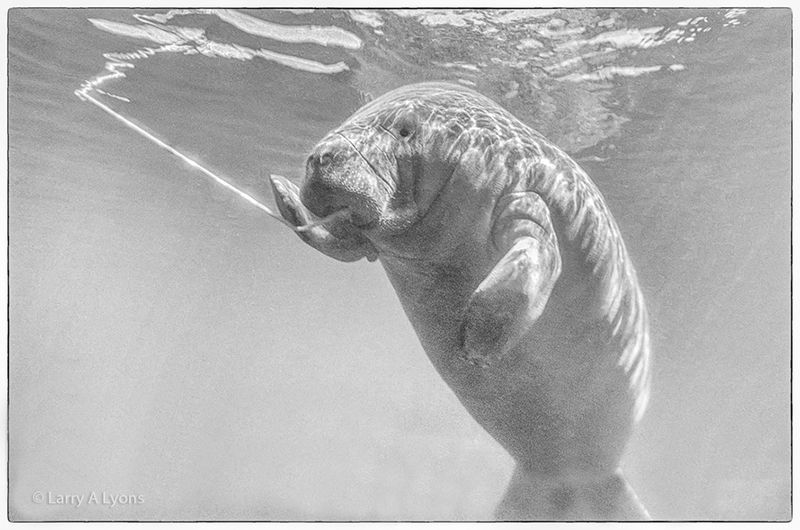 This manatee was attempting to remove any algae on this rope that was dangling in the water. Red tides are another major threat to the manatees. Red tides are algal blooms of a specific algae that contain neurotoxins. Red tides are naturally occurring events that will occur offshore. If the blooms move inshore, an extended algal bloom can occur from nutrient loading by urban and agricultural runoff. Manatees are exposed to the neurotoxins when they come to the surface to breathe and when grazing on grasses coated with the algae. The neurotoxins cause seizures and subsequent drowning of manatees. In 2013 it was estimated that as a many as 276 mortalities may have resulted from red tidal events. It is also important to note that the total mortality count for 2013 was 829 manatees, which is more than twice the mortalities reported in 2012. Female manatee is usually larger than the male and breeds only once every few years. It is believed that only one calf is born every two to five years. The gestation period is 12 months. The calf is dependent on its mother for a 12 to 18 month period. This low reproduction cycle creates a high level of risk for their long-term survival. News Flash: A July 2nd, 2014 news flash from the U.S. Fish and Wildlife Service (USFWS) stated that the agency is in the process of considering removing the manatee from the endangered species list to merely a species that is threatened. The USFWS is responding to a lawsuit originating from a citizens group, Save Crystal River, Inc. This citizens group is concerned about new idle-speed rules for watercraft and the expansion of manatee refuge areas in Kings Bay. It will be interesting to see how the USFWS decides on protecting the manatees. So let’s recap on the vulnerability of manatee populations in Florida and why this gentle giant should remain as an endangered species for maximum protection. Manatees require warm water sanctuaries like the Crystal River for appropriate habitat during the winter months for their survival. Manatee dependence of thermal discharges from power plants for warm water habitat should be cautiously monitored. Conservation efforts to enhance and manage ‘natural’ warm water sanctuaries in Florida are critical. Manatees have a low reproduction cycle with only one calf being born every two to five years. Manatees living, grazing and moving about in shallow waters causes a high level of risk from being killed or injured from the ever-increasing boat traffic in Floridian waters. In addition to the high vulnerability from watercraft, manatees are vulnerable to the loss of turtle grass habitat, which is their main food staple. The population is quite vulnerable to any extended cold winters. In addition, the sudden appearance of red tides can decimate a large portion of the manatee population. The possibility of even sustaining the current manatee population should be one of grave concern. A nice piece of work, Larry. Informative and interesting, and some outstanding images. Have had the pleasure of swimming with the “gentle giants” I concur we must protect this species . Great pics Larry… disturbing to see the mortality rate from yr to yr… not a good sign. I always liked how the looked… they are a big fav amongst my students. Larry, a very informative article on the gentle giant. I too have had the opportunity to swim with the Manatee on two different occasions. What an incredible experience to be so close with such a large under water mammal. When I swam in the Crystal River, there was talk of banning all tourist interaction with the Manatee. I see by your blog, that did not take effect. I hope the USFWS will continue to protect these beautiful creatures. …I wonder if the tour groups are required to apply a portion of their income to protect the wildlife? I remember the group I worked with was very concerned with the protection of the animals, but weary of the other tours available offering adventures which were less concerned with the protection of the animals and more interested in offering the ‘coolest’ experience. It is a shame that these or any of our planets creatures have to be a tourist attraction to get the funds or programs needed to keep them protected. Man has a way of screwing things up. 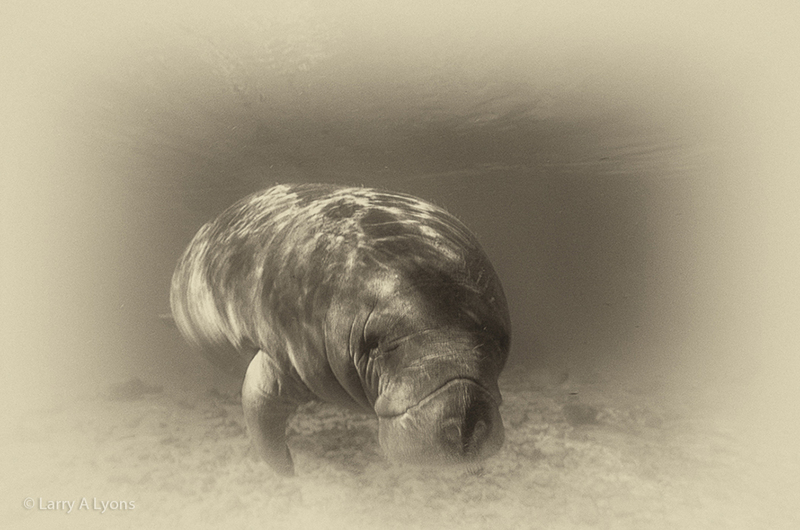 Aside from that, beautiful images of the Manatee. Larry you describe them as cuddly which I found funny. Not sure if I would have ever thought them to appear cuddly but I will now. Thank you for the interesting history and images. Great post Larry. Wonderful photographs and information. Merry Christmas, Larry to you and Coley! From your neighbors at Death Valley NP.